“The people of Fallujah are besieged by the government, trapped by ISIS, and are starving”, states HRW Deputy Middle East Director, Joe Stork. The World Food Programme has stated weakly that it is “concerned” about the food situation. In the annals of shamefully pathetic UN responses to tragedies of enormity this may be this 2016’s winner. Sources told HRW that both Iraqi government troops and the Popular Mobilization Force, one of about forty militia forces under the Ministry of the Interior are preventing food and essential goods from reaching the city. Those trying to leave the city are in danger of being murdered by ISIS. On 22nd March, one man who went to one of their checkpoints saying he had to leave, he could not take the situation any longer, was taken back into the city and executed. In late February a family trying to leave were also killed. On 30th March it was reported that thirty five people trying to leave had also been executed. Aircraft and artillery supplied by the US. “Neighbors reported to one former resident that on November 27, 2015, bombings killed 12 people in his neighborhood, including nine children. 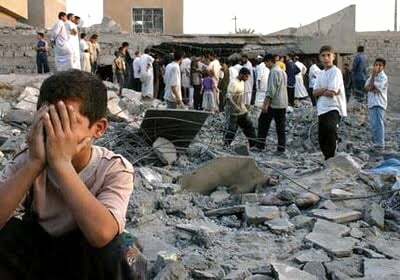 It seems it is Iraq’s plight to be starved and bombed as a result of US-UK policies. Thirteen years of the most draconian embargo ever administered by the UN, driven by the US and UK, with the UK heading the Sanctions Committee, the 1991 bombing, twelve subsequent years also of illegal US-UK bombing. Under Saddam there was a rationing system, ironically, commended by the UN for its efficiency – although hugely restricted by the UN for lack of imports. 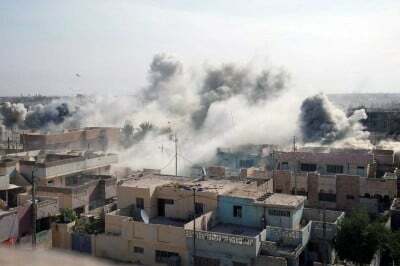 Since “liberation” Fallujah is another symbol of the sheer Western driven wickedness and iniquity that has befallen Iraq since 2003. Perhaps it is time Tony Blair – whose officials authored the dodgy dossiers that gave the excuse for the illegal invasion – lived up to the farcical Global Legacy Award presented to him by Save the Children in November 2014 and pitched up in Fallujah with desperately needed aid from his £multi-million charity and from his own £multi million pocket. It would be trivial amends, but it would be a start. Perhaps Save the Children could also atone for awarding a man who many eminent legal minds argue should be accounting for himself at the International Criminal Court in The Hague by doing the same. I feel a petition coming on.